This is a delicious recipe and the addition of the orange gives it a little zip. Place sliced onions in a soup pot on medium high heat and stir occasionally. Adding water if the onions begin to stick. 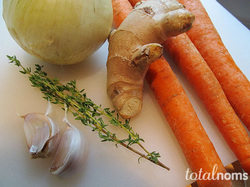 Add celery, carrots, potatoes, and ginger. Saute for about 5 minutes and then add water or veggie stock. Bring to a boil and then turn down heat to a low boil. Cook until potato is soft. Then add turmeric, dry ginger, and 1 cup orange juice. Remove from heat and blend. Salt to taste.